NEW YORK (Reuters) - European shares climbed on Tuesday as oil prices above $80 a barrel lifted energy stocks, while U.S. stocks slid on losses in chipmakers and rate-sensitive shares ahead of an expected Federal Reserve interest rate hike. U.S. consumer confidence also unexpectedly rose in September, lifting it to levels last seen in 2000, the Conference Board said, underscoring strength in the labor market and overall economy. The Dow Jones Industrial Average fell 69.72 points, or 0.26 percent, to 26,492.33, the S&P 500 lost 4.38 points, or 0.15 percent, to 2,914.99 and the Nasdaq Composite added 10.05 points, or 0.13 percent, to 8,003.29. 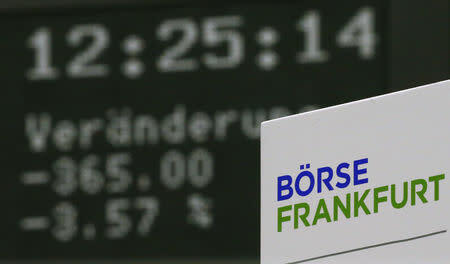 The pan-European FTSEurofirst 300 index rose 0.54 percent and MSCI's gauge of stocks across the globe gained 0.02 percent. "A lot of the noise around trade and anything else around politics really hasn't suppressed consumer confidence nearly to the degree that the other factors have boosted it," said Mike Dowdall, investment strategist for BMO Global Asset Management, in Chicago. U.S. crude oil futures settled at $72.28 per barrel, up 20 cents or 0.28 percent. Brent settled at $81.87, up 67 cents or 0.83 percent. The rise in energy shares, however, failed to squash broader market pessimism after new tariffs imposed by Beijing and Washington on each other's goods kicked in on Monday, and Chinese Vice Commerce Minister Wang Shouwen accused the United States of putting "a knife to China's neck." While the Fed is poised to hike rates for a third time in 2018 this week, European Central Bank President Mario Draghi on Monday raised expectations the euro zone will also start to normalize policy over the coming year by referring to "relatively vigorous" underlying inflation and brisk wage growth. U.S. 10-year Treasury yields held at a new four-month high above 3.10 percent after a $38 billion government debt sale on Tuesday. Benchmark 10-year notes last fell 7/32 in price to yield 3.1039 percent, from 3.078 percent late on Monday. The U.S. dollar weakened ahead of the Fed's two-day policy meeting, as investors have already priced in two more interest rate increases this year and some in 2019, leaving little room for further currency gains. The dollar index fell 0.05 percent, with the euro up 0.16 percent to $1.1765. "The U.S. dollar appears vulnerable... given extended speculative bullish positioning against most of the G10 currencies and considerable tightening already reflected in fed funds futures," said Eric Theoret, currency strategist at Scotiabank in Toronto. The drifting dollar helped gold edge higher. Spot gold added 0.2 percent to $1,201.01 an ounce.